You are currently viewing an earlier version of this article (February 13, 2019). In El Salvador, until 2016, patients with early-stage (IA-II-A) cervical cancer were advised to undergo radical hysterectomy with bilateral pelvic lymphadenectomy by laparotomy. This was regardless of disease stage, and it was associated with a higher healthcare cost as patients remained in hospital for an average of 7 days and were discharged with a bladder catheter for approximately 15 days. Formal training in gynecologic oncology in El Salvador is not available, and currently there are only nine practicing gynecologic oncologists. Consequently, in began training our residents in gynecologic oncology with a focus on minimally invasive surgery with Dr Rene Pareja in Medellín, Colombia. In 2017, we initiated a laparoscopy program in gynecologic oncology in El Salvador which has allowed patients in our country to access (Figure 1). However, the most important challenge was not the introduction of laparoscopic surgery but the additional application of conservative techniques in young. 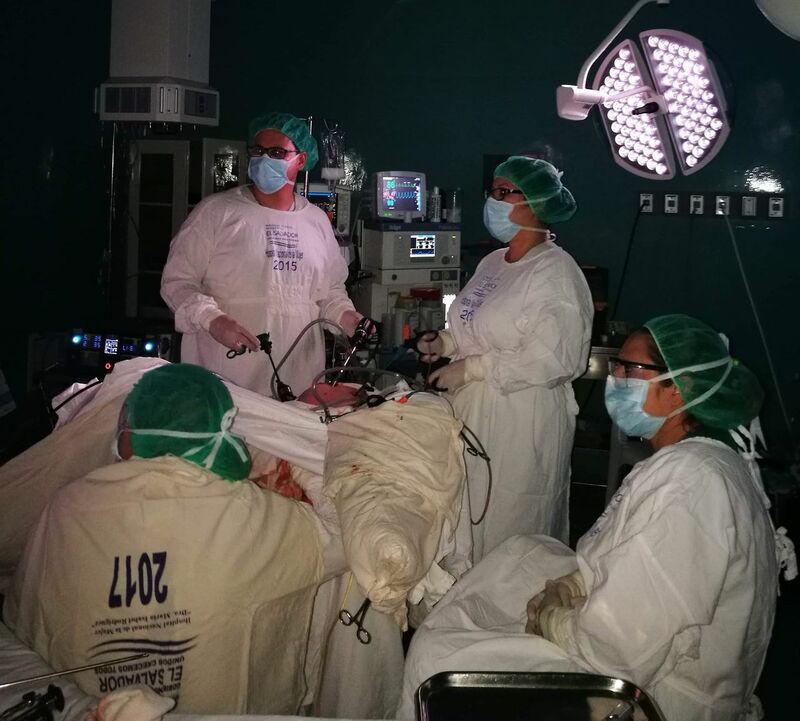 In April 2018, we performed the first laparoscopic radical trachelectomy in El Salvador. This was a case of a 20-year-old nulligravid patient, diagnosed with stage IB1 endocervical adenocarcinoma by cervical biopsy performed during colposcopy for abnormal cytology. The tumor measured approximately 15 mm. There was no parametrial involvement on initial pelvic examination. The patient underwent a chest x-ray, and pelvic and abdominal ultrasound that showed no evidence of metastatic disease. The patient was then presented in the multidisciplinary conference at the National Hospital for Women. The patient was briefed on the patient was discharged on the second day after surgery. The makeshift device to avoid stenosis of the cervical orifice was removed 21 days after surgery. The final pathology reported ulcerated adenocarcinoma of the cervix with a tumor size of 21 mm, negative surgical margins, no lymph-vascular invasion, and the invasion of the stroma was 0.5 cm. A total of 14 pelvic nodes were obtained and all were negative for metastasis. Ten months after the procedure, the patient remains free of disease recurrence. The patient has not attempted to get pregnant since her surgery. Currently the laparoscopy team is working to incorporate technologies and procedures to shorten surgical time, such as the introduction of advanced energies and the incorporation of sentinel lymph node biopsy in cervical and endometrial cancers. Contributors The author wishes to acknowledge contributions from: Dr Carmen Torres, collaborator during the surgical procedure; the Nursing Group for Operating Room 7 Elective Room at the Hospital Nacional de la Mujer (National Women's Hospital); the Oncology Gynecology team at the National Women's Hospital; and Dr Adelaida de Estrada, Director of the National Women's Hospital.